If you read my Strawberry Mascarpone Tart with Balsamic Glaze post, you already know that making pie crust causes me incredible anxiety. From the vague instructions- add ice cold water by the thimbleful until the dough just comes together- not too wet or too sticky (what does that look like? feel like?) 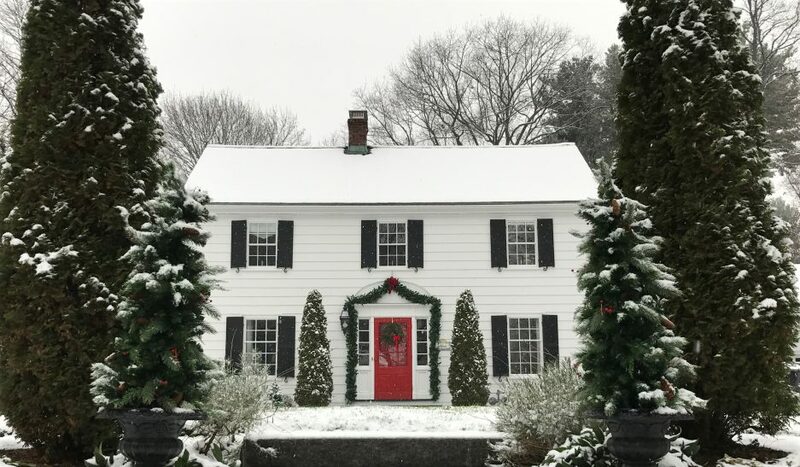 to the actual chilling, rolling, transferring to a pie plate, and please don’t forget the decorative crimping or lattice work. And that’s only if I even get to that point. Usually in my case things start going wrong almost immediately, beginning with adding too much or too little water. After chilling, the dough rarely rolls out smoothly and evenly. The edges are dry and cracking or the center is tearing or, more often than not, I’m trying to manage both crises simultaneously! The crust becomes a patchwork quilt of botched attempts at repairs. 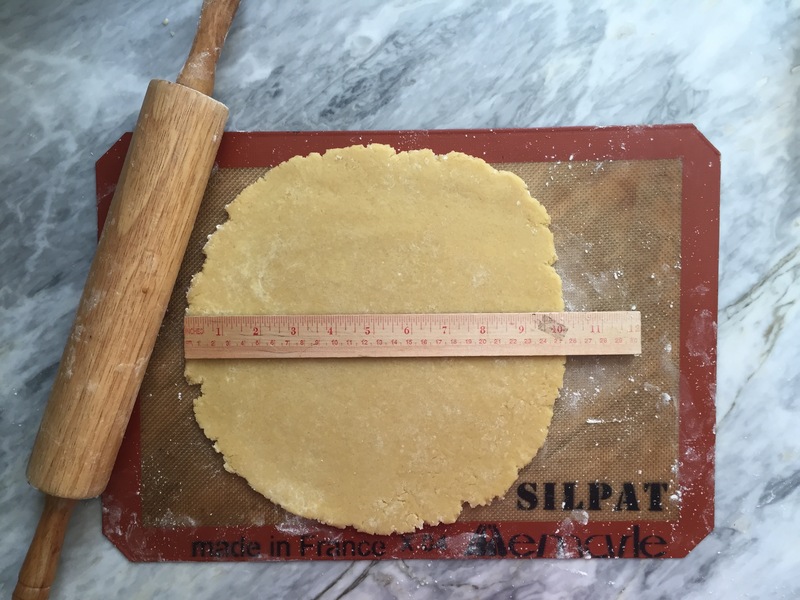 Then the transfer, have you seen how the experts roll up their pie crust around their rolling pins, then neatly unroll the crust into the pie plate? Are you kidding me? In my kitchen it’s all hands on deck, one person lifting the pie crust (still on the wax paper on which it was rolled), another helper quickly sliding the pie plate under the elevated dough, while a third person tries to flip the wax paper over and “release” the pie crust so that it flops into the pie plate. Which undoubtedly leads to more repairs. It’s enough to make me want to eat cake. Well, maybe almost enough. I really do prefer pie, especially in the summer with all the luscious ripe fruit that is available. 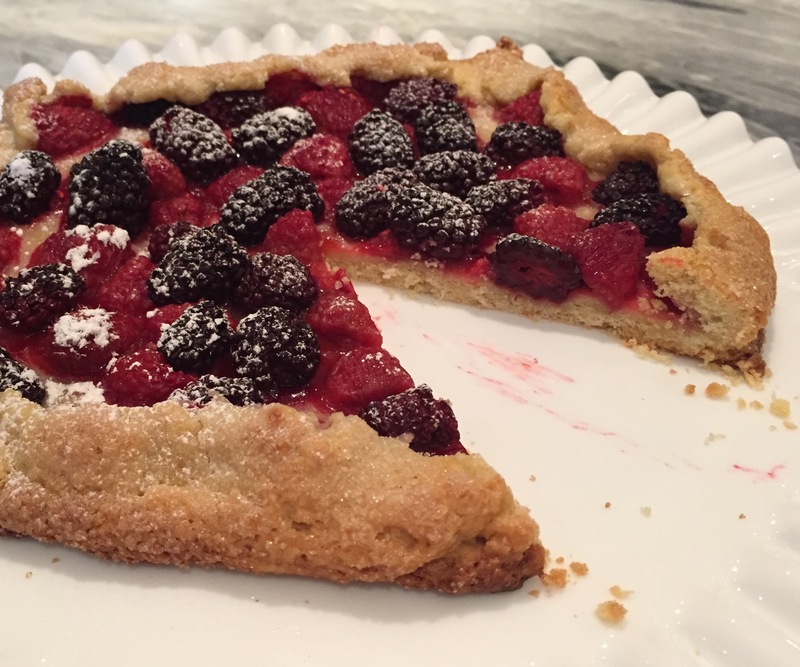 Like the Mascarpone Tart, the Crostata is another user friendly dessert with crust. This crust has the added benefit of an egg, which makes rolling out a breeze. Even better, you roll directly onto your parchment paper or silicone liner. No transferring necessary; you don’t even need a pie tin! As for decorative crimping or lattice- not with a crostata, all you need to do is fold an inch of crust over the edge of your fruit. 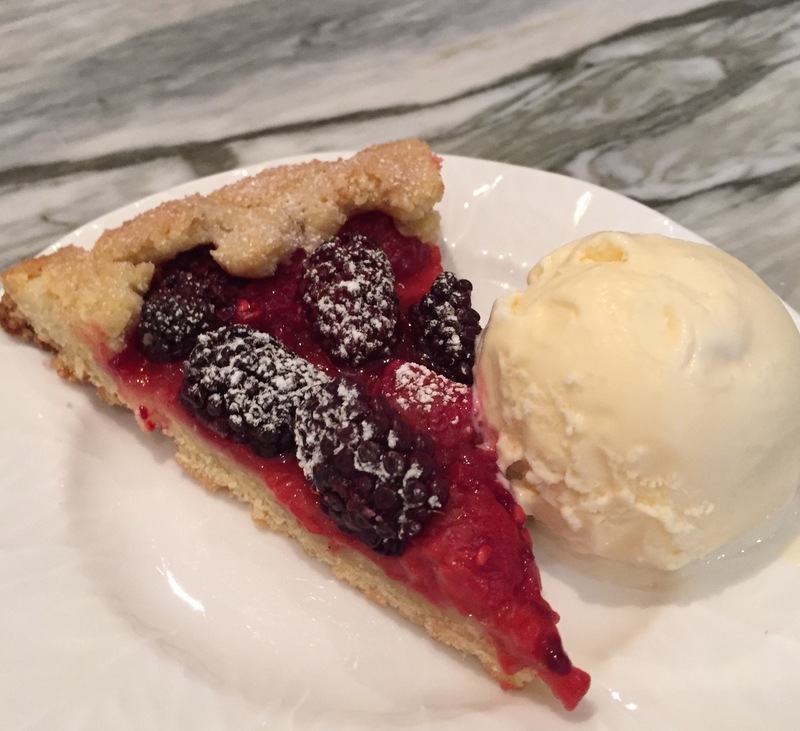 In honor of the 4th, this filling is made up of raspberries and blackberries to represent red and blue, while the white comes from vanilla ice cream served on the side. 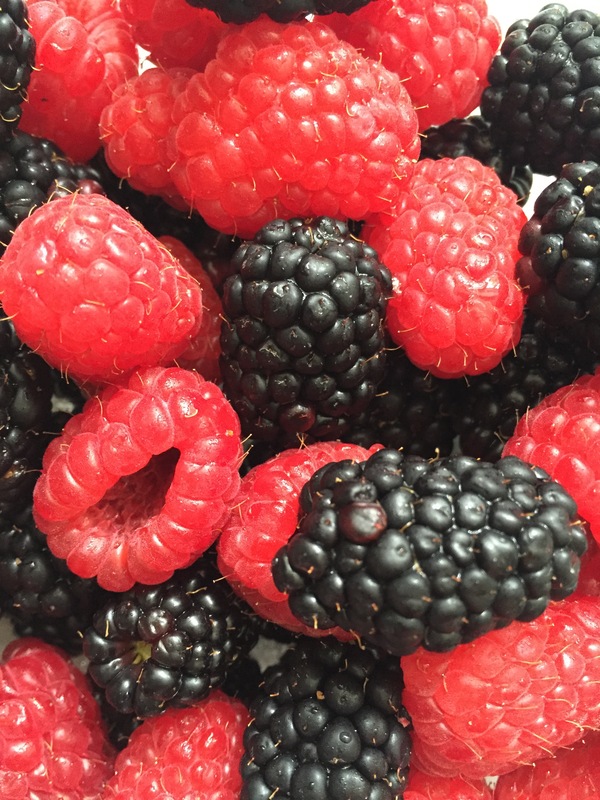 Feel free to use any fruit you want… depending on what’s in the fridge I’ve tossed strawberries and blueberries into the mix; peaches and raspberries are a classic combination, or go monochromatic and pick one of your favorite seasonal fruits to use. This recipe is so easy that experimenting is fun and delicious! 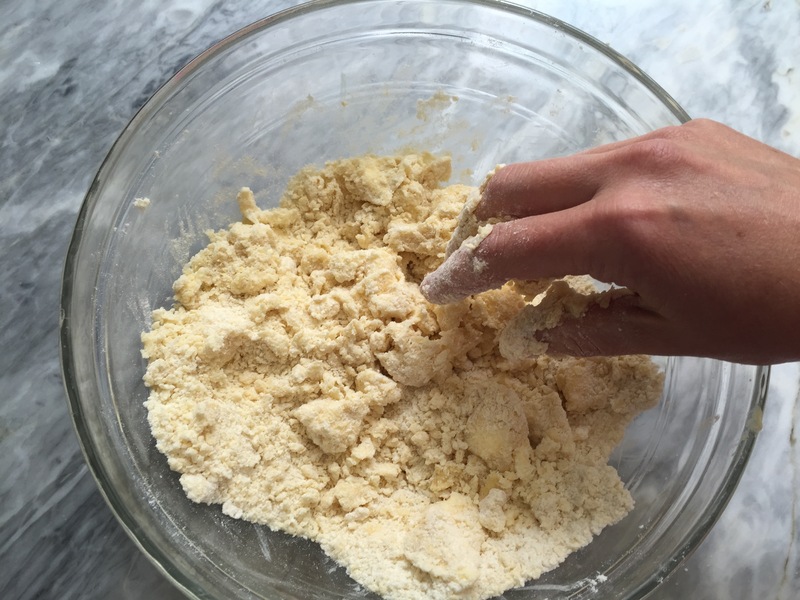 Make the dough: Combine 1 ¼ cups flour, ¼ cup sugar, and salt in a large bowl. Form a well in center of the dry ingredients and place the butter and 1 lightly beaten egg in the well. 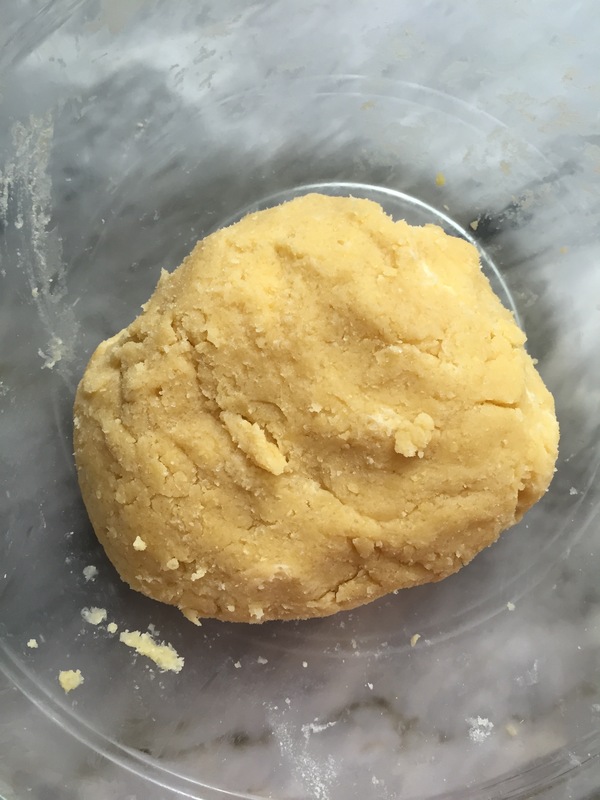 Using your hands, mix the ingredients into a soft, pliable dough. 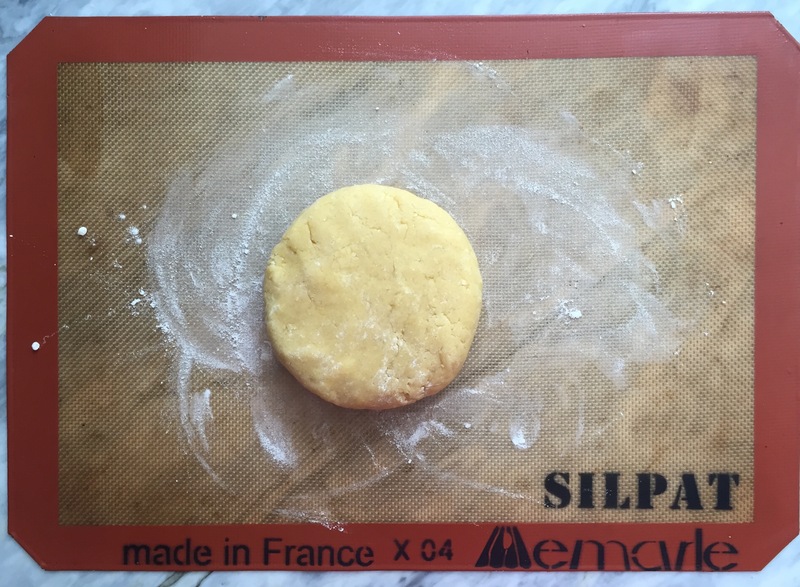 Form it into a 4-inch disk and place it on a lightly flour parchment paper. Lightly dust the dough with flour and roll it into a 10-inch circle. Place the dough with parchment on a baking sheet, cover the dough with plastic wrap, and chill for 10 minutes. Preheat oven to 375°. 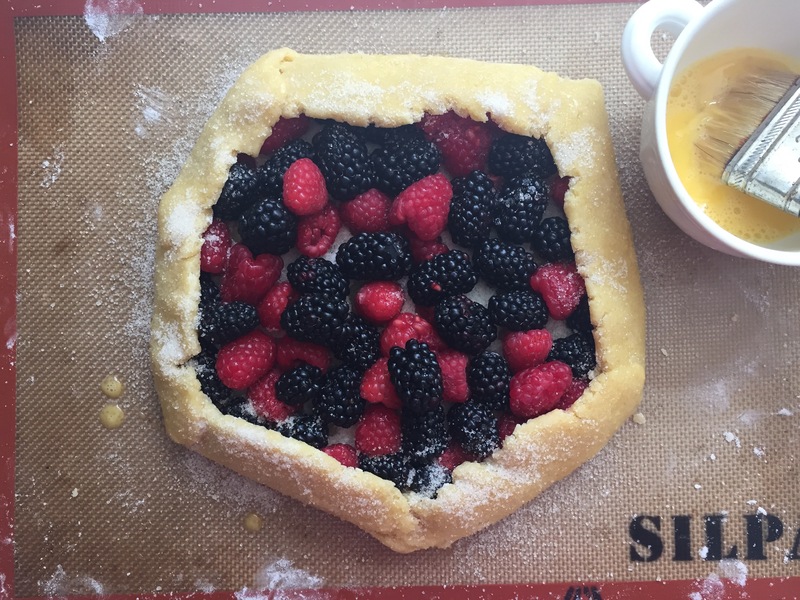 Make the crostata: In a small bowl, mix remaining flour and sugar and set aside. Remove the dough from the refrigerator and evenly spread the flour and sugar mixture on the dough, leaving a 1-inch-wide border around the edge. Place berries on top of the mixture and sprinkle with lemon juice. 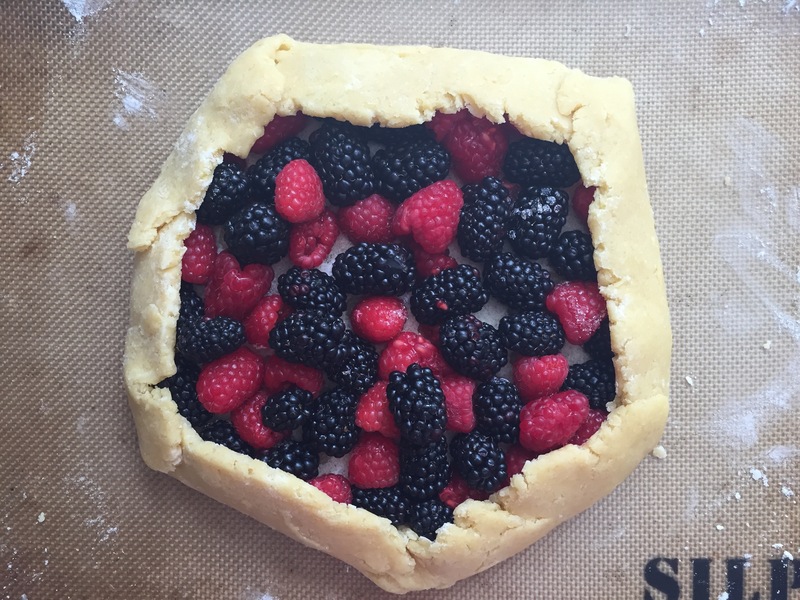 Fold the 1-inch border over the top of the berries to form a 9-inch crostata. Bake the crostata: Lightly beat the remaining egg. Brush the top of the crostata dough with the egg wash and sprinkle with turbinado sugar. Bake on the middle rack of the oven- about 35 minutes. 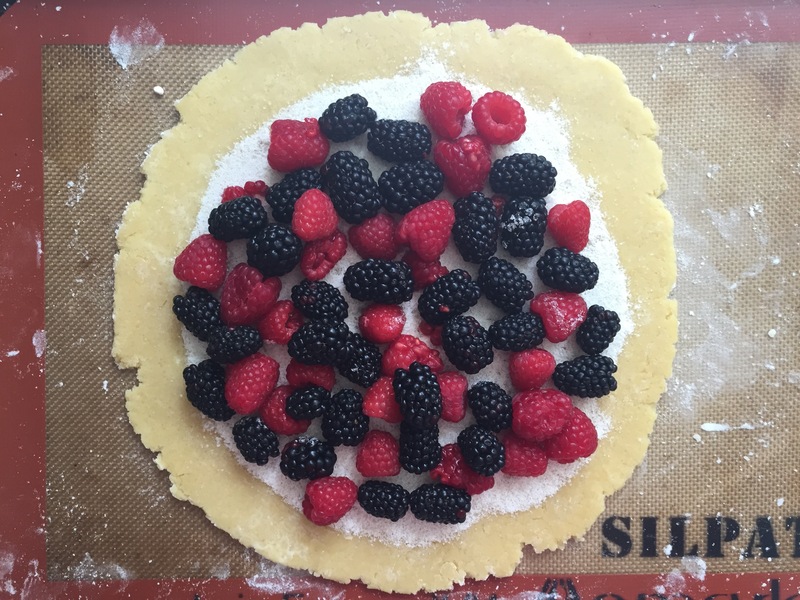 Remove from the oven and slide crostata with the parchment paper onto a wire rack. Cool for 1 hour. Serve warm or at room temperature. 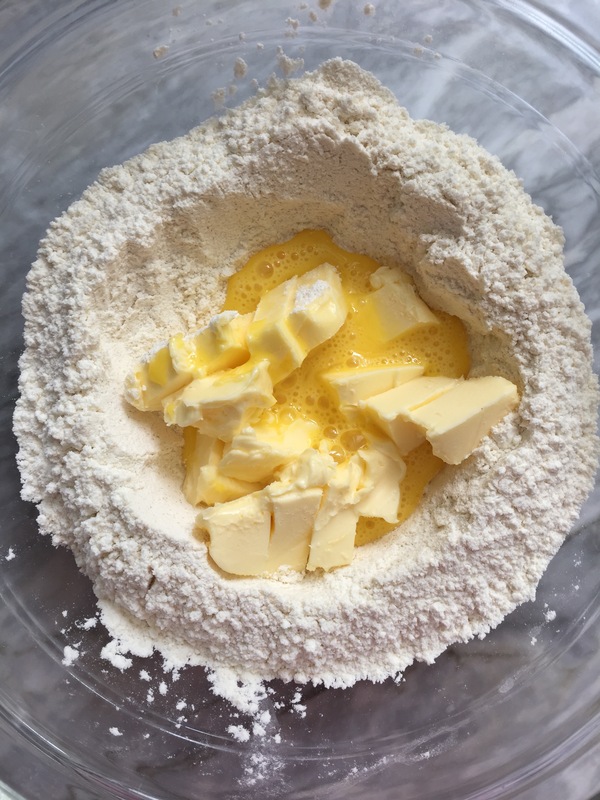 Make a well in the center of the dry ingredients and add the softened butter and one lightly beaten egg. Use your fingers to mix the dry and wet ingredients together. The dough has come together and is ready to roll. Lightly flour your parchment paper or silicone liner, as well as the dough. Roll the dough into a 10-inch round. Scatter berries on top of flour/sugar mixture. Fold a 1-inch border over the berry filling. Brush the crostata edges with lightly beaten egg and sprinkle with sugar. 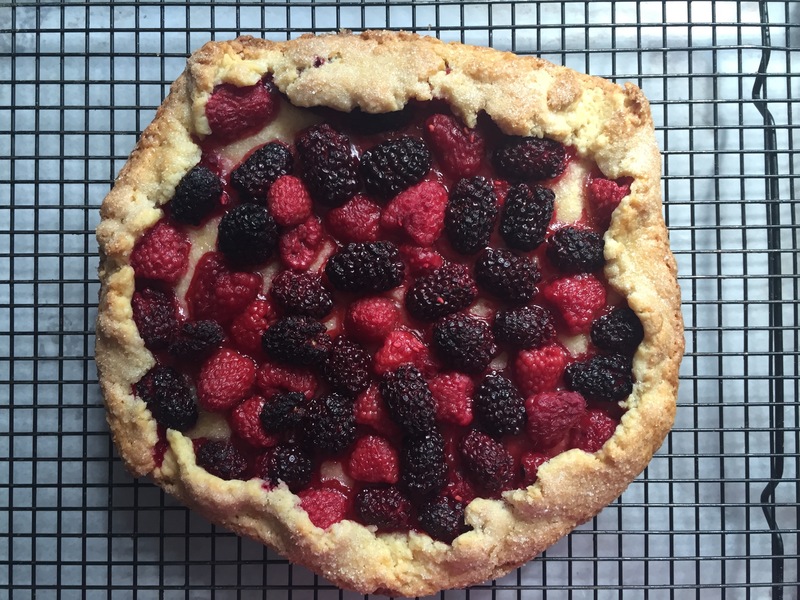 Transfer the crostata to a wire rack to finish cooling.